Is this how you will teach our future doctors? I sent a letter to all of my providers, carefully choosing my words so as not to offend and to encourage my providers to work with me and with each other to provide better care. Unfortunately that letter was met with defensiveness. Providers bucked at the idea that a patient could be so empowered and engaged as to write a letter questioning the system, find a way to communicate with her providers in an unconventional and yet legally approved manner (i.e. via email), and request boldly to move forward in care. I stood firmly as administration and other providers seemed condescending, yet I was willing to move forward. I was frank when your and other offices refused to comply with the provisions of the Health Information Privacy and Accountability Act. And in return, you have dismissed me. I ask then, is this how you will teach our future doctors? Will you teach them that when a patient speaks up and asserts their rights and asks for their doctor to provide better care that they should be disregarded? rejected? Will you teach them that when the patient says – you are not following the law – that they should not reconsider their practices? Will you teach them that when the doctor is uncomfortable it is okay to refuse to address the situation, to run from it instead of embrace it and look for ways to improve? Will you teach your students that “difficult” patients should be refused care? How very unfortunate this situation is that instead of growing together, you have chosen to negate me – my experience as a patient, my concerns and requests, my thoughts and feelings. I know too many patients so dismissed and negated, belittled by the very people meant to care for them. Here there could have been an opportunity for us both to change that narrative and to allow that narrative to ripple out to the next generation of doctors whose careers lay delicately in your hands as did my body. I wish you the very best in your practice and am happy to have you reconsider your decision for future care and collaboration. Note: After sending the original message to all my providers, I did send the following before receiving this letter. I guess asking for emails to be responded to and the law complied with means our relationship is “no longer therapeutic.” And I might note, just because you don’t like to communicate with someone via email does not mean you don’t have to. We all have to do things we don’t like to do, especially in healthcare. An email to Dr. Patel regarding a flex sig procedure she wished to perform. A return email to Sue West with the administration of the University of Colorado Health system to address the issues of the initial email which I copied Dr. Patel in on. An email to Sue West copying Dr. Patel and my PCP in asking her to ensure my emails would be returned (the email regarding the flex sig procedure was never returned). A message through the University of Colorado Health system portal asking that my emails be responded to and that not doing so was a violation of HIPAA and bordering on negligent (this message was never replied to). I received a letter (below) from my primary care doctor, Dr. Anne Klein part of the WISH clinic at the University of Colorado. Ironically, the WISH clinic markets itself as a patient centered medical home and yet has proven to be anything but patient-centered. 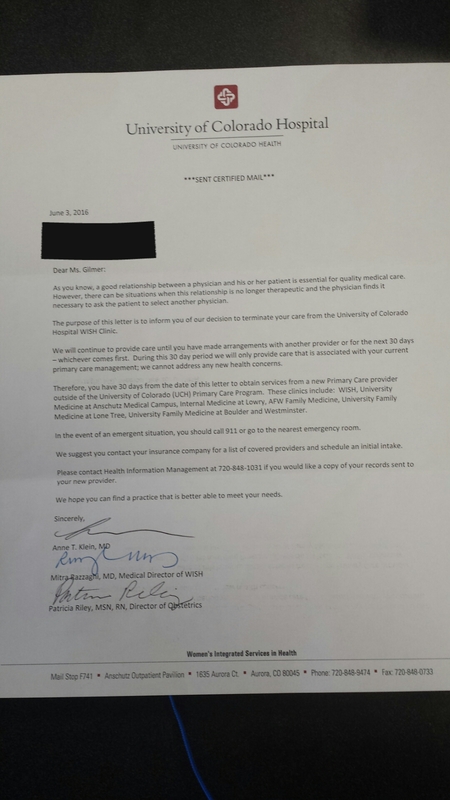 I received a letter (below) from my psychiatrist Dr. Jackenheimer, a resident under the supervision of Dr. Brian Rothberg at the University of Colorado Health Outpatient Psychiatric Services. Those responsible for mental health care should not discriminate against patients or retaliate against them for speaking up. No provider is allowed to retaliate against a patient for taking action under HIPAA and lest they say that the “relationship is no longer therapeutic” because of my message in general, these letters were not sent until I notified Drs. Patel, Klein, Jackenheimer, and Rothberg that they were in fact violating HIPAA. They did not take action until I deactivated my account in the portal at the University of Colorado Health system (MyHealthConnection). Only after these actions did I receive these letters firing me as a patient and refusing care to someone in need. I replaced the names Dr. Patel, Dr. Klein, and Dr. Rothberg at the beginning of this post and replaced them with “Doctors.” I felt that it was more important to make this about doctors in general than these 3 specific doctors. Their names are visible in the letters they wrote me, as are those who signed off on their actions. The wider issue is how they and other doctors in an academic institution will teach the future of the profession, that goes beyond any one name and in to what we want and expect in healthcare – respect, kindness, compassion. This entry was posted on Monday, June 6th, 2016 at 5:49 pm and is filed under Advocacy, Doctors, Health Care Providers, Health Policy, Patients. You can follow any responses to this entry through the RSS 2.0 feed. You can leave a response, or trackback from your own site. 4 Responses to Is this how you will teach our future doctors? Please note that I do not practice civil rights but health law and policy. And that approving this link does not in itself mean that I am endorsing the author of the post.